So as you may or may not have noticed, I have reached 500 followers!!! 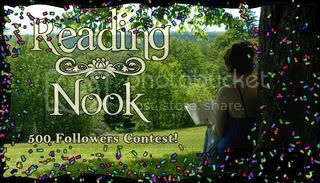 *throws confetti* So I am having a huge contest for all of my lovelies out there. Below you will see some of what is in store for the winners! I'm not sure how many winners I'll have, or what else will be given away. You can enter HERE and try your luck. Thanks to all my lovely followers new and old! Good Luck! Congrats on getting to 500 followers! Congratz! Thanks for the awesome giveaway! Congrats on reaching 500!!!!!!! And thanks for the giveaway. I added the link to my sidebar! Its very generous of you for the choice of books that you have arranged! Congratulations on reaching 500 followers and thank you for the amazing giveaway. Congratulations on the 500 followers! Great selection of books there. Congrats on 500 followers :) That's a big friggin deal!!! Congrats on 500 followers! That's a fantastic milestone! Congratulations and thanks for the giveaway, sound really good! Congratulations on 500 followers and thanks for the giveaway! Congrats on 500 followers and thanks for making this giveaway international! Congratulations! And thank you so much for this giveaway! All of these books look freaking amazing! Congrats on 500 followers! Awesome giveway! Congrats on all of your followers! I wish I had that many! And thanks for the giveaway, your very generous! Congrats on the milestone! Thanks for hosting the giveaway! Congrats on having over 500 followers! I'm new to your blog and I'm looking forward to reading your posts! Thank you for the giveaway! Congrats on the 500 + followers! And what a great giveaway, I see some really great books in that pile! Thanks for a great giveaway, and congrats on the 500. Congratulations on the milestone! Thanks for the giveaway! Congrats to you on followers! Thank you for the great giveaway! Congrats on 500+ (of which I am now #546)! :-) And thank YOU for the awesome giveaway! I'm looking forward to following your blog and reading your reviews. Congrats on the followers!!! That's awesome! Oh my gosh, thank you so much for this amazing giveaway!! :) Congrats on the 500+ followers -- you definitely deserve even more to come! Congrats on your milestone! And thanks for the awesome giveaway! Wow - that's a great milestone! Happy 500 followers and thank you so much for the chance to enter. Thanks for the giveaway, but more importantly congratulations! I can't wait until I get that many followers too! congrats on your follower milestone!! Congrats on reaching a whopping 500 followers! And thanks for this amazing giveaway!